Hootsuite users frustrated by the platform’s inability to post directly to Instagram have had their prayers answered… by Instagram. The San Francisco-based social media icon/Facebook division announced on Tuesday that it had added new features to its Instagram Graph API (application programming interface) to help businesses more effectively manage their social media content, including the ability for businesses to schedule posts, view posts they have been tagged in, and view other business profiles. In related news, Vancouver-based Hootsuite announced in a Tuesday post of its own that it was integrating scheduling and publishing for Instagram directly into its cloud-based platform, a feature which had been absent from the Instagram support introduced in 2015. In a Jan. 30 statement prominently featured in Instagram’s announcement, Hootsuite CEO Ryan Holmes called the feature the “number-one request” from the company’s 16 million customers. While Hootsuite users had been able to compose Instagram messages from within the platform since 2015, it still required them to post the messages on Instagram itself. As a workaround, Hootsuite used push notifications to let users know a message had been scheduled and was ready to be published. Since then, Instagram has become the Hootsuite platform’s fastest growing social network, with more than two million photos and videos shared every month through the platform, according to Hootsuite. 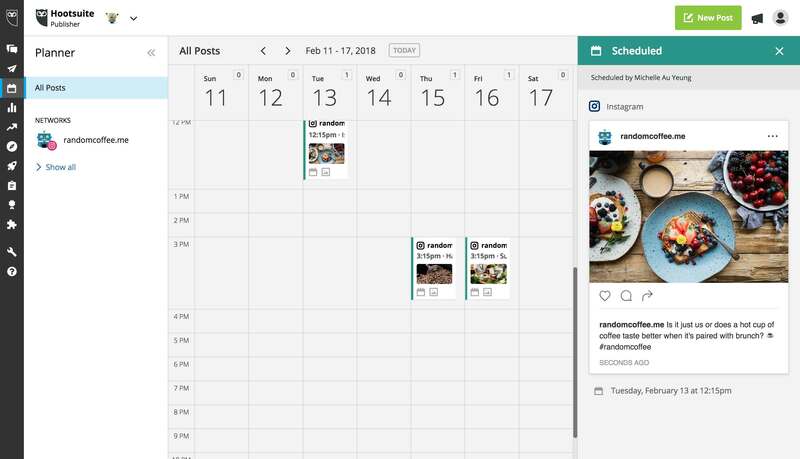 Now, thanks to Instagram’s updated API, Hootsuite customers will be able to schedule and post photo content directly through their Hootsuite dashboards. In addition to scheduling posts, other business-friendly features added to the Instagram Graph API since its introduction last year have included organic insights and comment moderation.